Head north through Uxbridge and out into the beautiful Hertfordshire countryside, passing through the locks at Harefield and on towards the historic town of Berkhampstead. 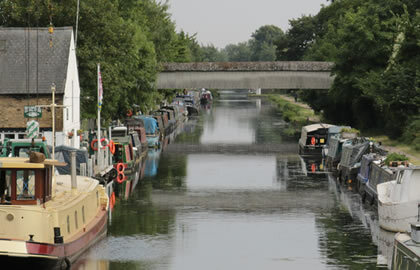 Cruise northwards from Iver along the Grand Union canal climbing up the Colne Valley and the Chiltern Hills passing through a landscape of lakes, woods and mills and parks belonging to the Earls of Essex. Visit Frogmore Paper Mill which is the world's oldest mechanised paper mill, still working and producing paper - the birthplace of paper's industrial revolution. 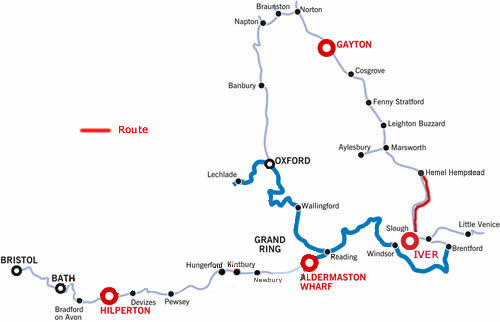 This route takes you along the delightful Grand Union Canal, with lots of interest along the way with towns and villages to stop off and explore. Leaving your mooring cruise east towards the end of the Slough Arm at Cowley Peachey Junction. Turn left at the junction onto the Grand Union Canal. You will reach your first lock at Cowley Lock as you start the climb up the Colne Valley and the Chiltern Hills. Cowley and Uxbridge to your right is the last of the outer suburban belt that surrounds London, and you will soon leave all that behind. There is a large shopping centre in Uxbridge, access from Bridge 186. The Battle of Britain was directed by the late Air Marshal Lord Dowding from the RAF HQ in Uxbridge. The town has a selection of modern and futuristic buildings. In the early 19th Century the Paddington Packet Boat used to run daily from Paddington to Cowley , pulled by 4 horses, it made the 15 mile lock free journey in a remarkable time, taking passengers up and down the canal. Uxbridge Lock is in an attractive setting with a lock-keepers cottage at the side, and a modern flour mill with lovely landscaped gardens right down to the waters edge. Between the A40 Road bridge and 183 Denham Bridge there is a gravel wharf on the off-side loading into large barges, so beware of them operating and allow them to manoeuvre in the deepest part of the channel. The canal continues northwards past the village of Denham through a landscape of lakes, woods and mills across Harefield Moor, a stretch of common land with much wildlife to enjoy. East of Bridge 80 there are shops at South Harefield. Black Jack's lock and Copper Mill Lock are very attractive with tiny timbered cottages, a small mill, and attractive canal side buildings. The big mill at Copper Mill was once a paper mill, but when the Canal was built it re-invented itself and made copper sheets for the bottom of boats. There are canal side pubs at bridge 180 and 177. After heavy rain there is a strong current between bridge 177 and Copper Mill Lock. The canal turns eastwards towards Rickmansworth, and old chalk quarries adjoin the Canal. There are some interesting 16th century farm buildings close by to Stockers Lock. You can Moor close to bridge 173 it is 4 hours to here , at Blatchworth Locks in a marquee on the lawn between the locks is Annis Kitchen serving drinks and snacks in conjunction with the Canal Centre there. You will be taking the right hand lock when continuing northwards. Just before the lock is a Tesco supermarket with moorings for patrons. Rickmansworth is off to your left north of bridge 173. North of Rickmansworth is Common Moor to your right and Croxley to your left where part of the old village still survives with several attractive houses around the village green, and Watford where the canal keeps well away from the town and instead climbs through Cassiobury Park, a long and lovely stretch of wooded parkland. The park was once part of the 17th C gardens of the Earls of Essex , and in the avenue of limes many of the trees are 300 years old. The Park stretches for 190 acres. You can moor here for the night if you fancy a lovely setting. It is 6 hours to here. If you want to have some refreshment tonight then continue northwards through the Park and Whippendell woods off to your left to Grove Mill, a water mill . Just to the north is a famous ornamental stone bridge that the Earl of Essex insisted that the canal company build before he allowed them to build a canal through his park. The canal follows the course of the River Gade, so twists and turns through the valley. The lovely village of Hunton Bridge will be your mooring for tonight, it is 8 hours from last nights stop. Moor by bridge 162, the Waterside Tavern has moorings. Kings Langley off to your left is soon reached, there is a useful store just west of bridge 158. Kings Langley is a small country town and there are the remains of a palace there. The tomb of Edmund de Langley, brother of the Black Price lies in the Norman church. The canal climbs steeply passing several large paper mills in Apsley. The shops south of bridge 152 are much closer to the canal than those in Hemel Hempstead. There are several large Canal side pubs as you pass Hemel Hempstead , like the Paper Mill pub near Apsley marina - Large waterside pub with open fires, balcony and terrace serving classic British food and real ales. Also the Fishery Inn near Bridge 149, - Rustic pub, with an open fire, waterside terrace and banquette seating, serving British grub. Hemel Hempstead is a well planned new town with excellent shops built around a charming old town with attractive streets. The Old Town Hall is an Arts centre in a Victorian building with an imaginative programme of theatre, comedy and music. To the east of the canal close to Lock 67 is the Paper trail- a fully working Victorian paper Mill, with visitor centre and tours . - Frogmore Paper Mill is the world's oldest mechanised paper mill - the birthplace of paper's industrial revolution. Today it is still a working paper mill producing around 100 tonnes of specialist grade paper every year on historic paper machines. Open- 2017 – Every Thursday and the first Sunday of each month from 11.00 to 16.00. Open for pre-booked group visits only on all other days. The canal enters Berkamstead by its back door and proceeds through the middle of the town. Moor here for the night it is 8 hours to here . There is a useful supermarket on the towpath between bridges 53 and 52. Berkhamsted is a market town with buildings of all periods. There are also the ruins of a Norman castle where William 1 received the offer of the English crown in 1066. Berkhamsted lies on the western edge of Hertfordshire, bordering the Chiltern Hills. Over much of the last millennium it was an important market town with strong royal and literary connections; today it is a vibrant residential and cultural centre, and while it is now part of the Borough of Dacorum it has retained its own strong identity. Together with the adjoining village of Northchurch it is separated from other towns and villages by lovely countryside, all of it in the Metropolitan Green Belt and much of it classified as being an area of outstanding natural beauty. The Old Mill Pub is in a great location beside the Grand Union Canal in Berkhamsted. Its old mill-race thunders (or trickles, according to the season) over a weir and through the secret courtyard off the bar and the building retains the character of its Georgian & Victorian origins. Throughout the length of the canal running past the town there are interpretation boards depicting local industry and navigation. Cruise up to the winding hole at Cowroast Marina unless you can turn before, and make your way home. It is 2.5 hours up to the winding hole, and 20 hours from there back to where you started from, so over 4 days just under 6 hours per day cruising , plenty of time to stop and explore on your way back everything you missed on your outward journey!